This is Sergi from Barcellona, Spain. He is a location manager for films. He was at Cathi's Cafe to bring take out food for his friend/co-worker who was sick and stayed in the hotel. I tried to show off my spanish, but the girls took my line. Other than greeting, I knew only the W word (P in Spanish) related expressions. So, per my request, Sergi began to give me a lesson. Since he is such a gentleman and nice guy, the tone of his speech just could not match his words. The contradiction was very funny. However, consider if his mother ever see this video, she might want to use some of them to greet my mom. Since neither of us want to see that happens, I am not going to include that clip in my blog. Ah... what the heck. It is too good to be a secret. India did not impress him. He says INDIA stands for "I Never Do It Again", for there are too many people and too much misery. We both love Vietnam, for friendly, affectionate people. He says in Spain, although people are well paid, they spend more as the cost of living is even higher. Hence the quality of life is low. Whereas in Vietnam, although people are not making much, but the quality of life is very good due to the low living standard. I was in Cathi's Cafe because I just finished a tour to historical sites. The drop off spot was on the other side of the town. So I decided to walk around a bit. 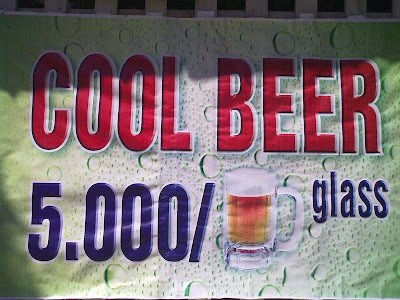 When I got a bit tired, I saw a sign of 5,000VND draft beer, and these engergetic young ladies. The reasonable priced beer convinced my sense, the chicks sensibility. After I promised them to bring a pizza.